I managed to get two costs of paint on the coamings and the areas that needed touching up, I got the Andersen bailer installed, and the electrical system completed. First, the Andersen bailer. managed to get it set in pretty good. Still have to cut the screws shorter, but I’m waiting for the paint and the sealant to dry before I trim them. Here’s the bottom. This is the ‘Mini’, the one that mounts from underneath. All this bailer bails is the cockpit. Second, and more importantly, the Electrical system is finished. I had been pricing the battery at a few places in town and online, and the best price I’d found locally for the one I wanted, was in the $180-$250 range. i’d seen them for $110 online, but had fears about possibly getting something undercapacity or a cheap knock-off. Usually, you get what you pay for. However, this morning we were running early to drop my wife off up by northlake and while she got her Starbucks, I stopped in at Batteries plus. 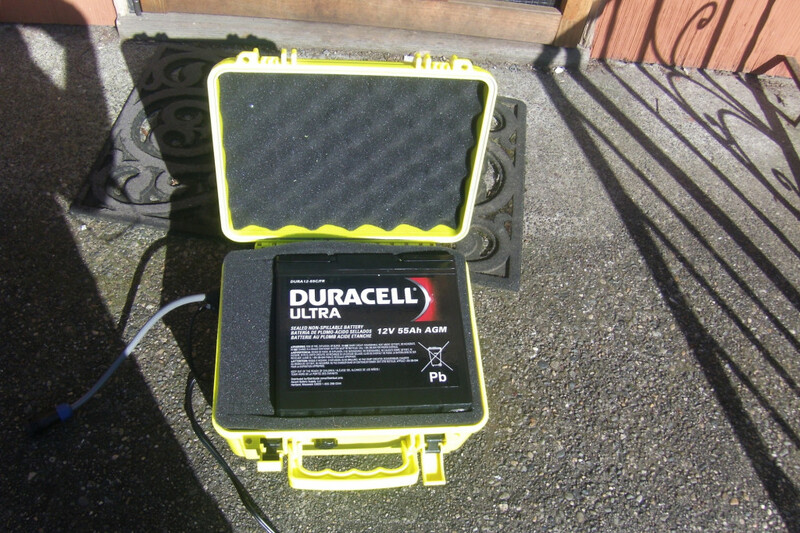 imagine my surprise when i found they had a Duracell Ultra group 22 AGM battery for $125. It just fits in the enclosure I found that just fits in the designed-in battery space in the boat. it’s rated for 55 amp hour. The case is one I found from a company called Cases By Source. Here is the battery mounted in the configurable foam inserts that came with it. 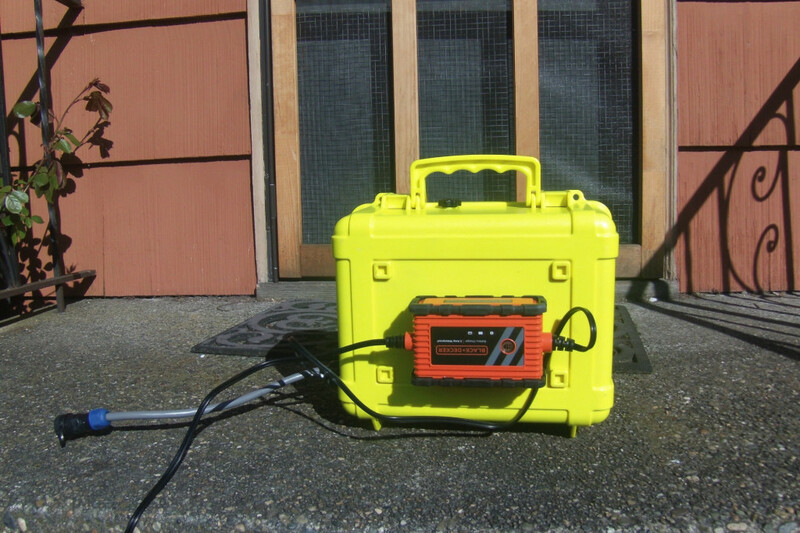 It makes a great portable power unit. 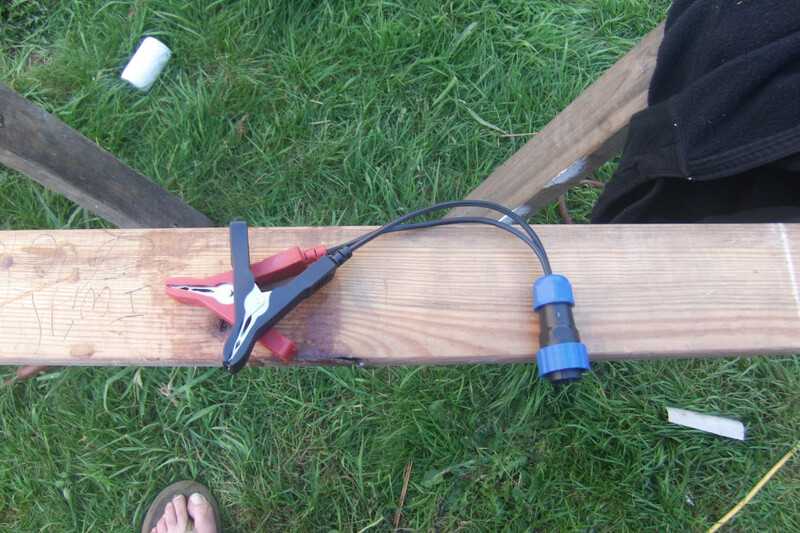 On the side I have two cables coming out, with gland nuts to keep them waterproof. One of these goes to a waterproof connector that plugs into the boat, so it is easy to remove and reinstall. I also made up this pigtail, so that i can directly connect to the battery if i need to use an external charger, or some other use. Oh, right. charger. When I started putting this together, I thought about including a charger inside the box in the extra space, but that got me thinking about heat, and if it would fit. So, I started looking online at small chargers. I stumbled across one that was waterproof, but only 800 mah. 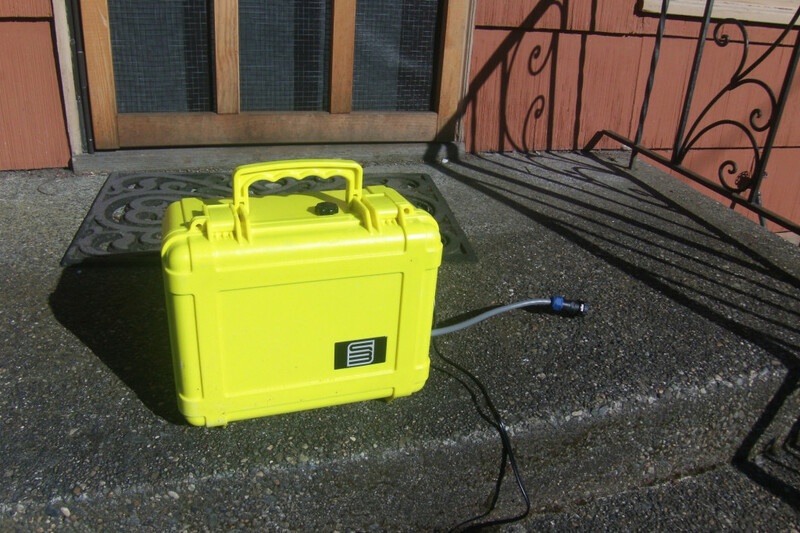 I hadn’t even thought that anyone would make a ruggedized charger. A little googling and a short drive to home depot later, and I had a 2ah IP67 rated smart charger, from black and decker. 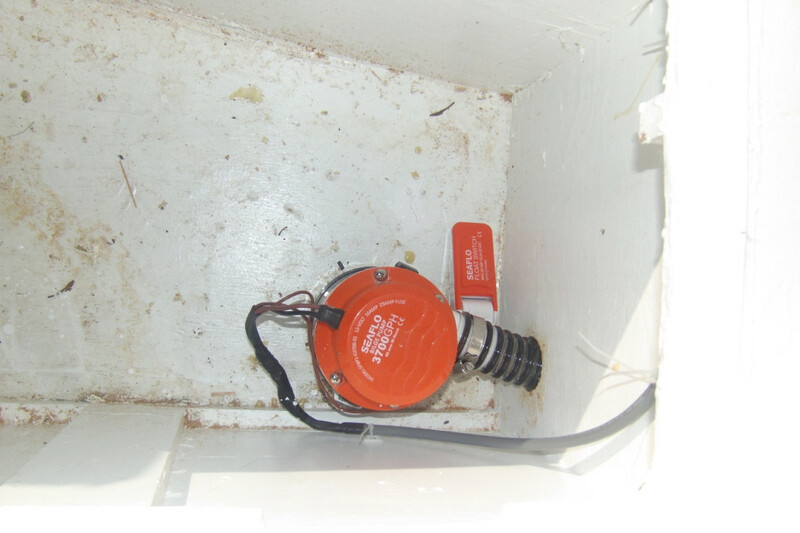 This I mounted to the side of the box with heavy-duty velcro, and wired in to the battery in the box via a gland nut. So, it’s easily removable, and self contained. Here’s a shot of it in the boat. In this picture, you can also see the pump peaking out from around the corner. 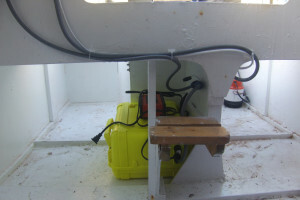 The battery box will get attached to the centerboard trunk with a strap, thru that slot in that stiffener that is visible below the connector. The pump is one from my sponsor, Seaflo. it’s 3700 GPH. 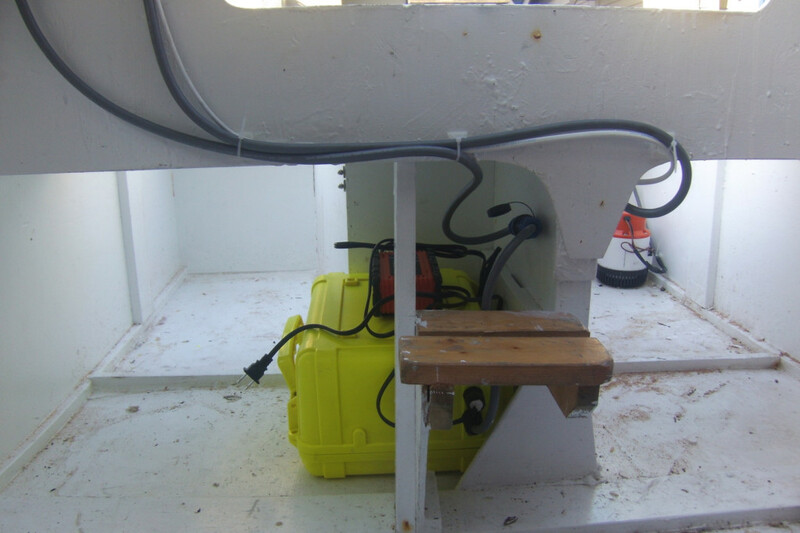 This is there as an emergency dewatering pump, in case of capsize or any situation where I need to dewater the cabin. 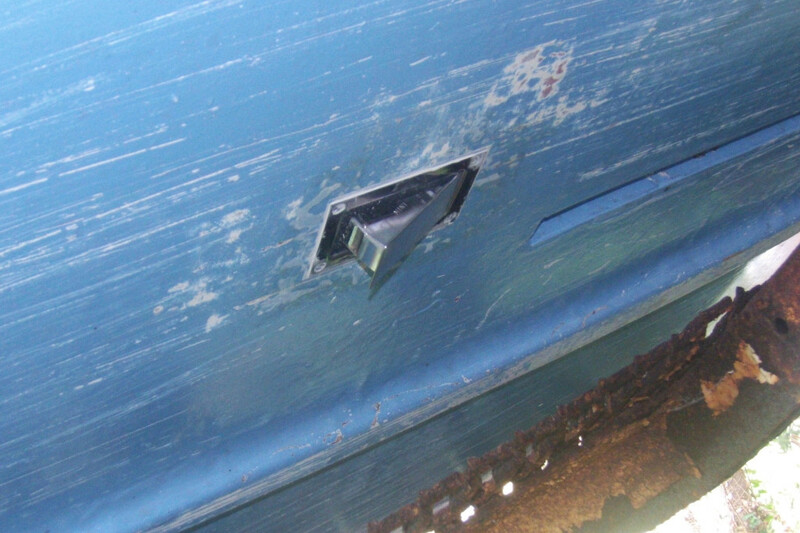 It has a float switch, and a manual, always on mode selectable from the switch panel in the cabin. in theory this should work for about three and a half hours before the battery goes dead. This shot shows the routing of the outflow. It only is dealing with at most a foot of rise and a straight hose with no bends, so it should really move the water. I may end up adding a one-way valve in the lazzarette, if I find it necessary. i don’t think it’ll be an issue except in some really bad conditions. 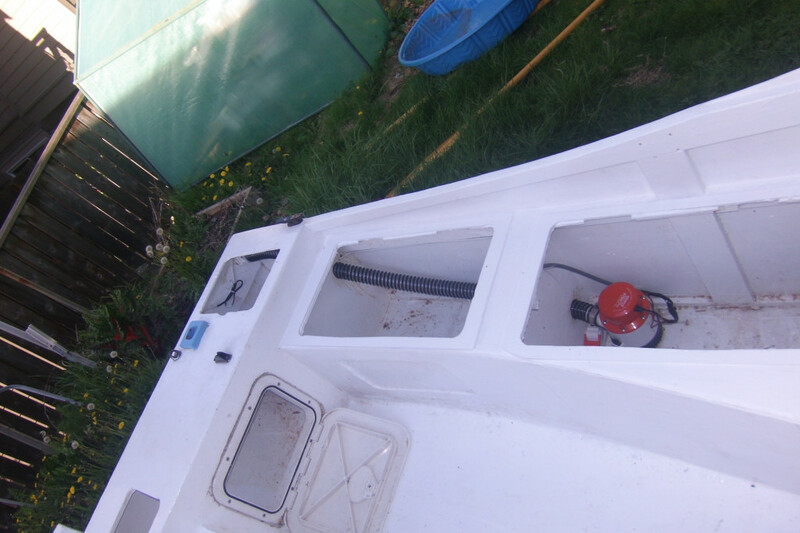 Once I get the hatches in the boat I’l be taking it to the boat ramp to perform some tests. Things are really getting close as far as getting the boat ready. All I can think of once I get the hatches in is that I’ll need to make the tiller extension, mount the mainsheet cleats, bolt on the oarlocks, and fit a compass. beyond that I’m into ‘would be nice’ territory. Hopefully, i’ll have it all ready to go for the CYC cruise to Poulsbo next weekend, as a shakedown trip. Financially, what I do need to do is either find some benefactors or start piling on the overtime to get the personal equipment I’ll need. drysuit, radio, etc. The starting gun is in 80 days, and i’ll need between $600-1500 to get equipt, depending on what corners i cut.